Â This novel is by the same author who wroteÂ Elisha’s BonesÂ which I loved. So I settled into this one fully expecting something, if not like it, at least as well defined. It is not.I had to let this one sit for a couple of days before I could write this review.This is a psychological thriller and frankly, it is not a light read. In some ways that is a good thing, in other’s not so good because it gets deeply reflective so that you are not sure what the story is about or where it is going.There are a lot of readers who like that kind of suspense in a novel. I prefer storyline suspense. Keeping the reader in suspense while all the characters know what’s going on is not a tactic that I have a lot of patience with. Once I found out what CJ Baxter’s brother was capable of, I could finally settle into the read because I knew where it was going. You may not have that problem at all.We get a clue when brother Graham sucker punches CJ during a little basketball one-on-one at Grandfather Sal’s funeral. The little blurb that shares a CJ memory of a so-called hunting accident happens many pages later. This is when the story should take off like a rocket blast, but it doesn’t. We must meander around reminiscing about the younger years of CJ, meet his mom and find out how rotten his dad was to her and her revenge. Which all ties together when we find out what really happened long ago and why CJ just can’t seem to connect with Dad and Brother Graham.The climax is the best part of the story (isn’t that the way it is supposed to be?) but it isn’t just one eye-popping moment. We’ve got several in a row which keeps the pages turning and the midnight oil burning. It’s a keeper.To read the first chapter, you can goÂ HERE. To purchase you can find it at Amazon.com, Christianbook.com or goÂ HERE. Â Â Â Â Don HoeselÂ is a Web site designer for a Medicare carrier in Nashville, TN. He has a BA in Mass Communication from Taylor University and has published short fiction inÂ Relief Journal. He lives in Spring Hill, Tennessee, with his wife and two children.Â Elisha’s BonesÂ is his first novel. 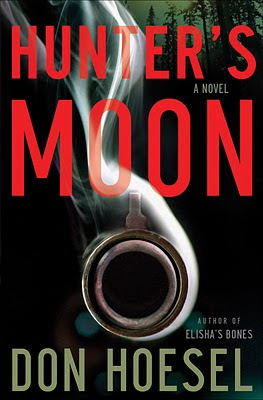 No user commented in " Hunter’s Moon by Don Hoesel book review "